Let’s face it. Finding a puncture or leak is not easy. It’s like finding a needle in a haystack. 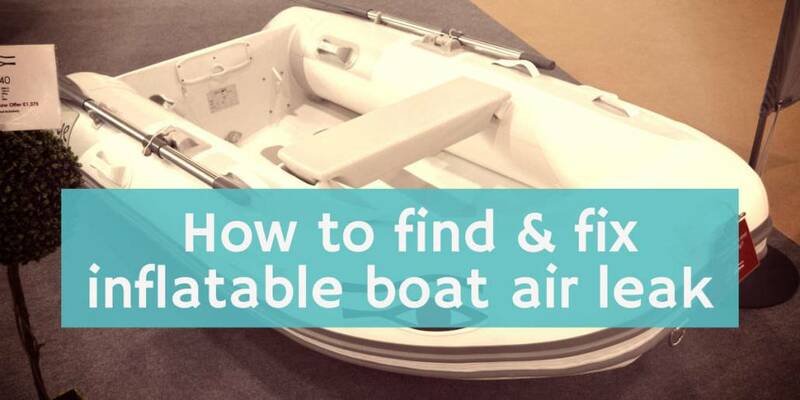 First off, inflate your boat in a quiet place and try to listen for the leak. If you hear any hissing and can narrow the area down, you’re golden. Use a spray bottle to identify the exact source of the leak. If you have no idea where the leak is coming from, spread the solution over the boat with a hand towel or large sponge and look for bubbles. Escaping air would lead to the formation of bubbles over time; if you see bubbles forming in an area, that’s where your leak is coming from. Don’t stop after finding one! 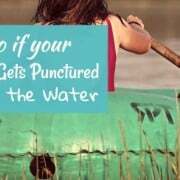 Chances are there are other punctures or leaks in your inflatable boat. It’s better to check and fix all of them at the same time. If you can’t find any punctures in the material of the boat, the air leak might be caused by poorly fitted valves. To check, simply apply soapy water around the valve and check for bubbles. Poorly fitted valves are actually the number one cause of slow leaks. Now that you’ve found the leak, what’s the next step? If you suspect that the valve is the source of the leak, verify this by using a soapy water solution. 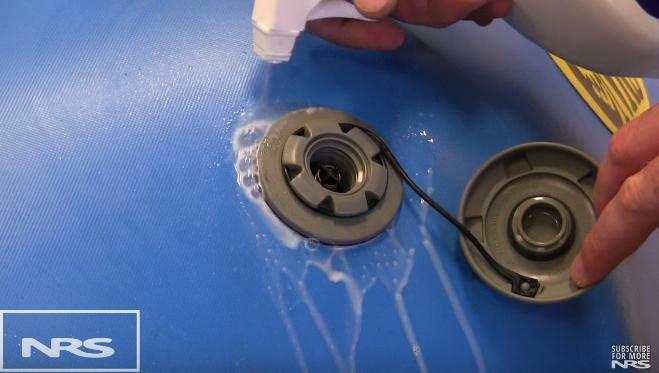 Inflate the dinghy, and then apply the soapy mixture around the valve and on its cover cap. Check for bubbles. Air might leak around the valve perimeter, cover cap perimeter or even the area around the entrance of the valve housing. To determine how to fix the problem, you must know which of these three parts the leak is coming from. If the leak is coming from around the valve perimeter, there is a chance that the valve is poorly-fitted. In this case, you should remove the valve and clean the area where it is inserted, then put the valve back in place and tighten it. For leaks that are coming from the cover cap perimeter or from the area around the entrance of the valve housing, you can quickly seal it by applying glue or sealant around the valve housing perimeter. You can also put a drop of glue inside the opening. Household silicone sealant may also be applied instead of glue. It’s also possible that the rubber seal ring of your inflatable boat will accumulate dirt and debris over time. There’s also a possibility of it getting worn out. This will also result to air slowly leaking from the valve perimeter. Also, the valve itself may be the culprit. Unscrew the valve and clean it thoroughly. If your valve rubber seal ring accumulated dirt and debris, you will need to pump air into the open valve with an air pump to remove them. But, keep the hose away from the valve’s unlocked pushpin. Putting a little bit of acetone can help clean dirt around the valve housing perimeter. Just remember to leave the valve open for the acetone to dry. 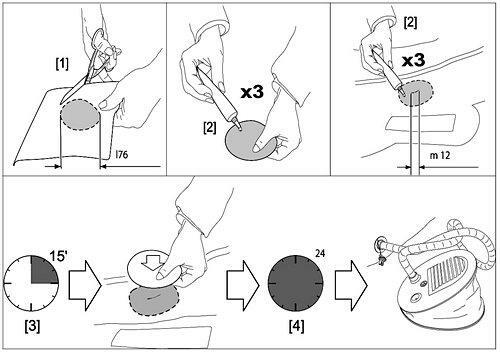 If the rubber seal ring has been worn out, you will need to replace it. It is important to determine how big the leak is to know how to fix it. Refer to the guide below. Punctures less than 1/8” in size can be repaired without a patch. You will only need either glue or a sealant. Deflate your dinghy and clean the area to be repaired. Apply a drop of glue or sealant to cover the puncture. Note that the surface to be repaired should be dry before you apply the glue or sealant. Also, remember to use the appropriate glue that suits the material of your inflatable boat. Inflate the repaired chamber but only 3/4 full. Apply a larger drop to coat it better. Punctures that are as big as 1/8’ or bigger will need patchwork. Fret not! Your inflatable boat usually comes with a repair kit, but if not, this is the one I use. Below is a step-by-step guide on how to patch up a leak. Mark the area to be repaired. Cut a piece of the patch repair material by approximately 2” off the edges to overlap the damaged area. Apply a thin layer of glue on the underside of the patch. Use a brush. Wait 10 minutes for the glue to set. Apply another layer of glue on the underside of the patch again. Use a brush. Apply a thin layer of glue around the damaged area as well. Use a brush. Wait for 3 minutes for the glue to set. Firmly put the patch on the damaged area. Apply a 3 to 5 lbs weight on the repaired area for 24 hours. Put another layer of glue around the edges of the patch to completely seal it. Let it dry for at least 6 hours. Here is a nice video on the process as well. A pro tip: It is recommended to do repairs in dry weather. Humidity can cause a decrease in your glue bond.